For nearly three years Christina of Creating my own garden of the Hesperides has been hosting the meme which focuses on foliage in the garden. I believe her intention was to explore the important role which foliage plays in the garden, and remind everyone that although flowers often steal the stage, foliage remains to carry the show. Going out this week with the intention of focusing on foliage surprised me in two ways. First of all I always assumed I was one of those “immature” gardeners who always falls for the flash of flowers and doesn’t have much foliage interest. That was wrong…. apparently nearly all flowers come with some kind of foliage (who knew!) and even the most flower blinded gardener will have foliage. Secondly I learned another important revelation…. my garden looks much, much better in close-ups! Starting with A and Artemisia is as good place as any, and while we’re here I guess we’ll just keep going along the front street border. 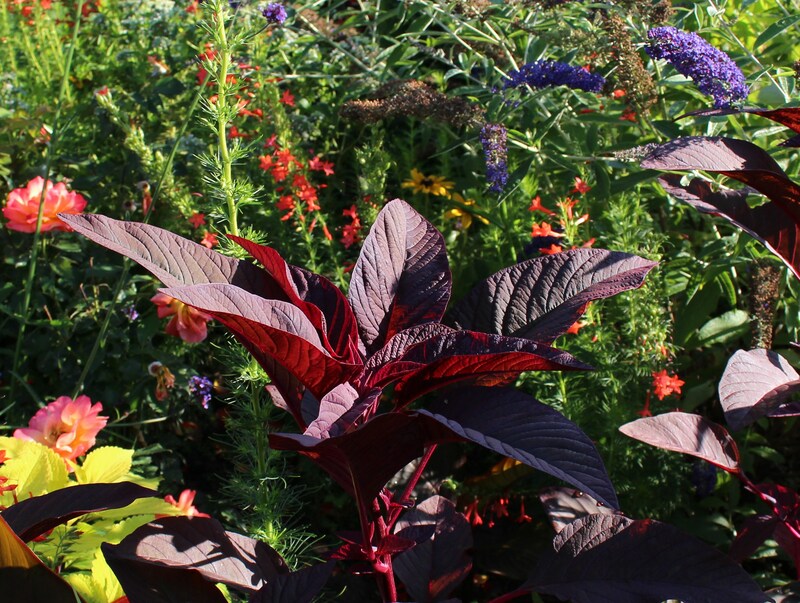 Soil improvement this spring and moving things around brought in plenty of seed-laced compost, and “Hopi Red Dye” amaranthus is easy to spot with its dark red leaves. Amaranthus “Hopi Red Dye”, as easy to grow as its more weedy relatives. 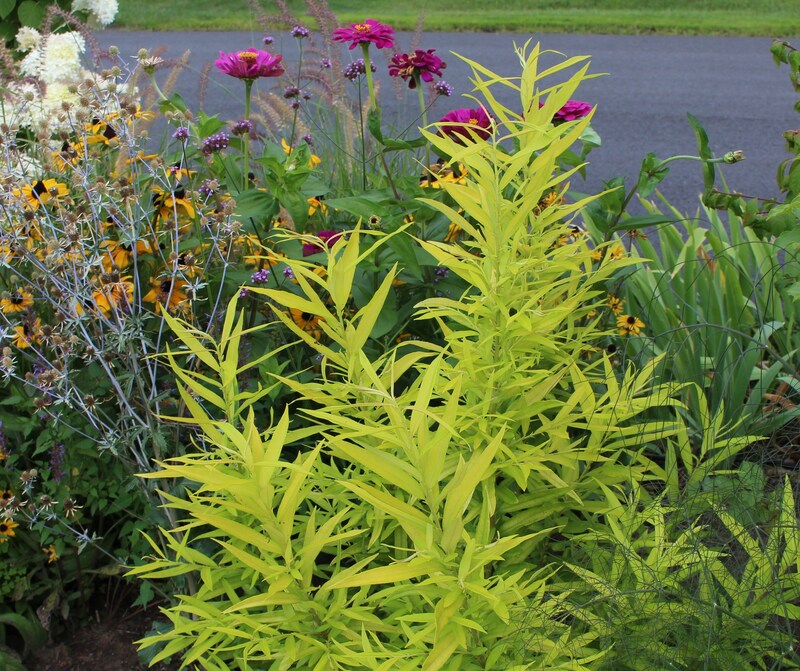 I like purple leaves, but I don’t think I can resist a plant with yellow foliage, and this “Golden Sunshine” willow was an impulse buy last year. Rabbits mowed it down last winter but willows don’t sulk and this one bounced right back. Actually I think cutting this one back to the ground each spring would probably be the best way to keep the bright new foliage coming. Salix “Golden Sunshine”… or at least I think that’s what this willow goes by. I really need to have a better recording system for my plant IDs. If pushed I might even admit to having too much yellow foliage around the yard. Arundo donax “variegata” in the front perennial border. 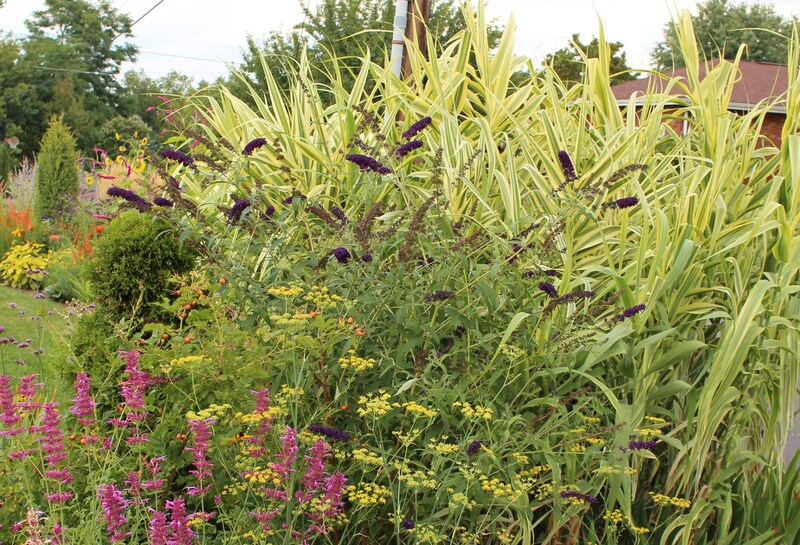 An explosion of color with “Black Knight” buddleia, pink agastache, and yellow fennel blossoms. 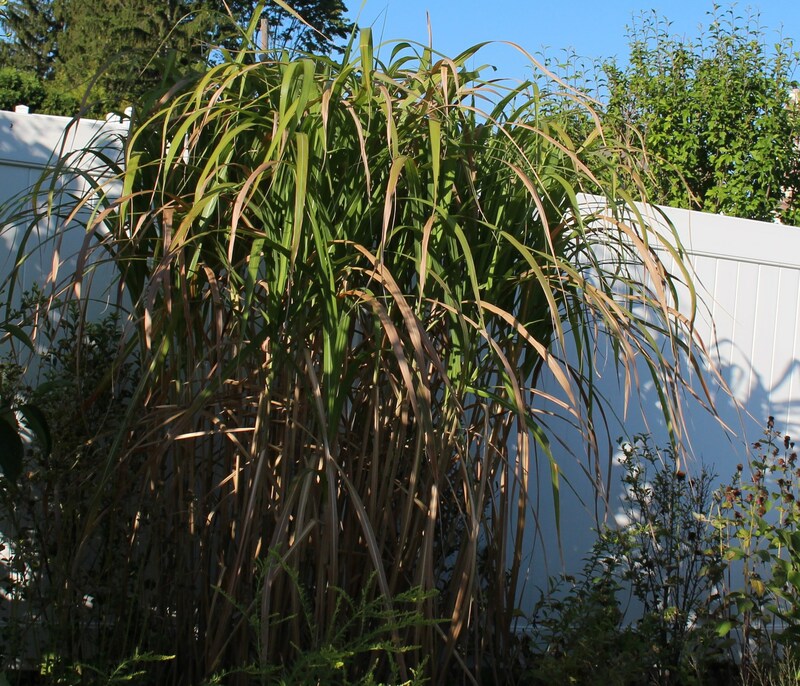 Btw, the arundo is probably 8 feet tall and the butterfly bush 6. Also it’s unusual for the grass to have this much color so late in the summer. Usually the heat makes it go all green. Here’s a little blue in the blue spruce I moved last spring…. and more yellow. Have I ever mentioned my love for the foliage of “Tiger Eyes” sumac? It suckers around a bit, but in my mess of a garden that’s no big deal. I haven’t yet decided if this is a formal enough planting for the front of the house though. 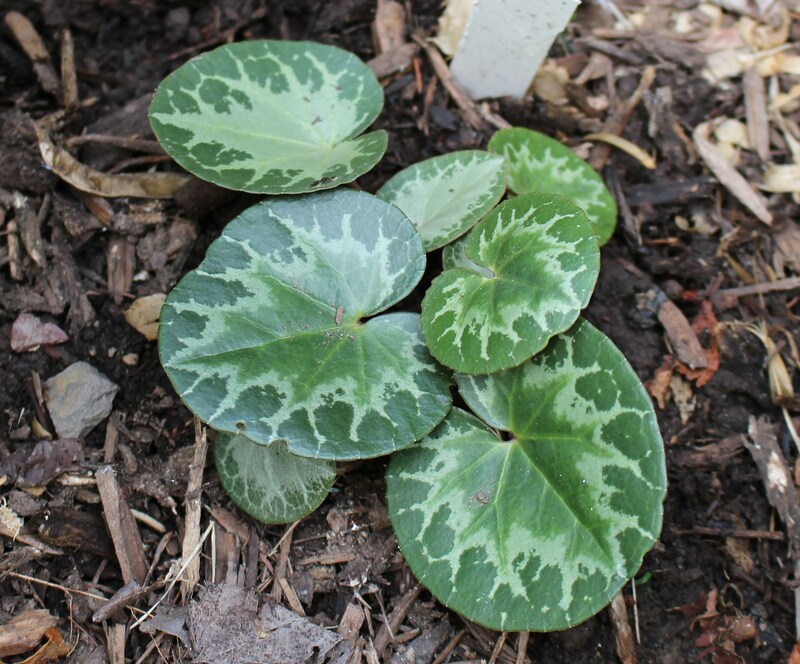 A foliage post without mentioning a cyclamen is just crazy, so here’s my little c. purpurascens plant (probably two or three plants since I see at least two leaf forms). I took a lot of pictures so this may be all over the place, but I’ll try to finish up the front yard first. 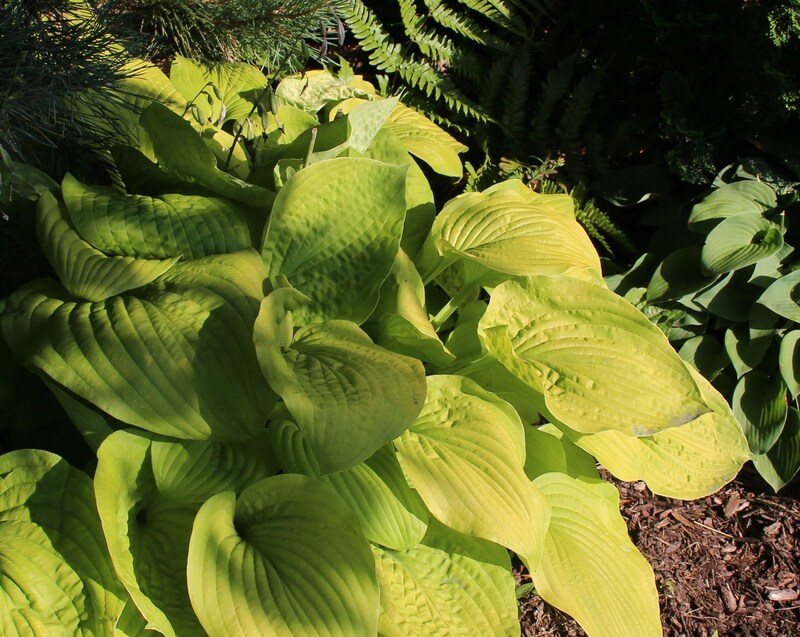 Sometimes people think of hosta when they hear the word foliage, and I’ve seen them in a few gardens here and there (just a few!). Here’s “August Moon” a favorite old variety which lightens to nearly white when in full sun. Hosta “August Moon” in one of my few shady areas. Moving into the back near the (another yellow) sunflowers is the new heuchera patch. Someday you’ll suffer through an all out heuchera post, but until they grow in a bit I’ll let you off with just one. 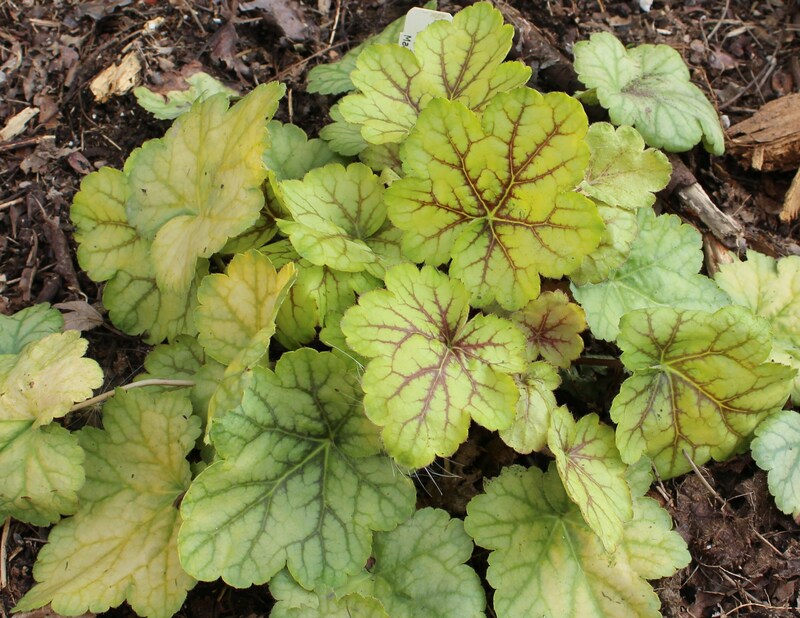 One of several new heuchera plants, heuchera “Circus Clown” is off to a good start with a nice mulch and some much needed rain. It’s amazing how the colors on these plants change throughout the year. The reason the heuchera can survive here is from the shade of a Seven Sons shrub/tree (heptacodium miconioides). My plant gets cankers and loses trunks every now and then but I hope it someday gets past that. Right now I’m enjoying the rich green of the curled stiff leaves. Kind of a coarse look, but for a guy with so many cannas and dahlias refinement isn’t one of my strong points. 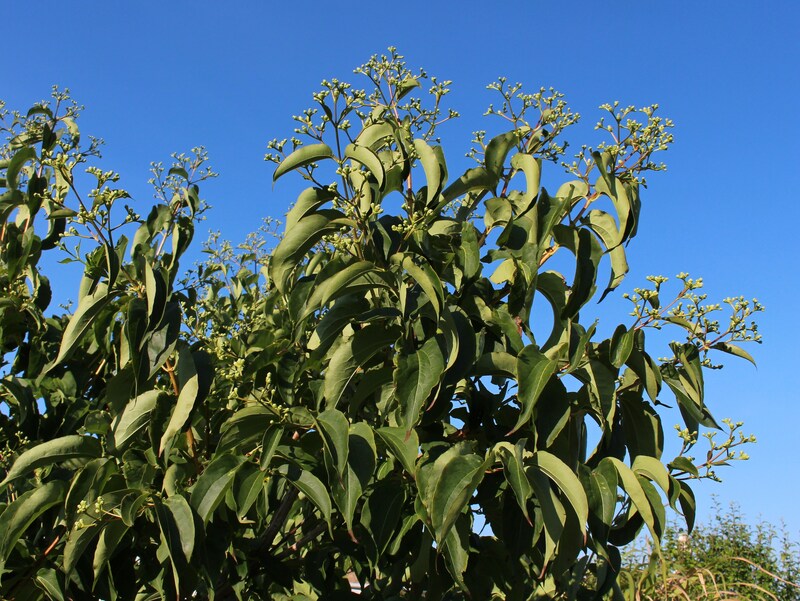 Heptacodium miconioides leaves against a perfectly clear blue sky. Enough with the babbling. Look but don’t touch. 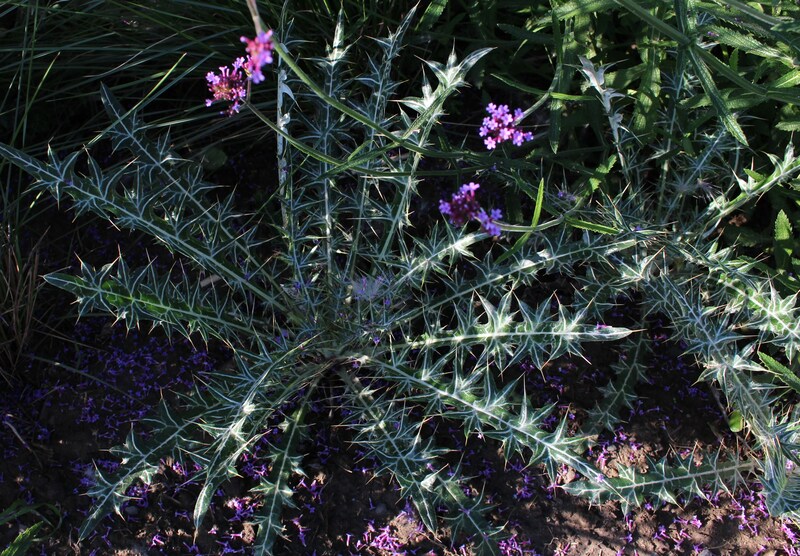 Ptilostemon diacantha with verbena bonariensis blossoms. Of course this is where all the missed baseballs end up rolling. Almost good enough to eat, plants in the vegetable garden (or potager when I’m feeling fancy) also can put on a good show. Not all the foliage news is good. Miscanthus giganteus was off to a good start but our dry spell threw it for a loop and killed off all the lower leaves. Miscanthus giganteus wants the steady moisture which I’m too frugal to supply. It might be easier to get something else for this spot. Back by the house is a panicum “Cloud Nine” which is much more comfortable with drought. I hate this bed and constantly neglect it, but nature did its own thing and filled the gaps with rudbeckia, phlox, and patrina scabiosifolia seedlings. Sure beats the boring mulch I had there before. 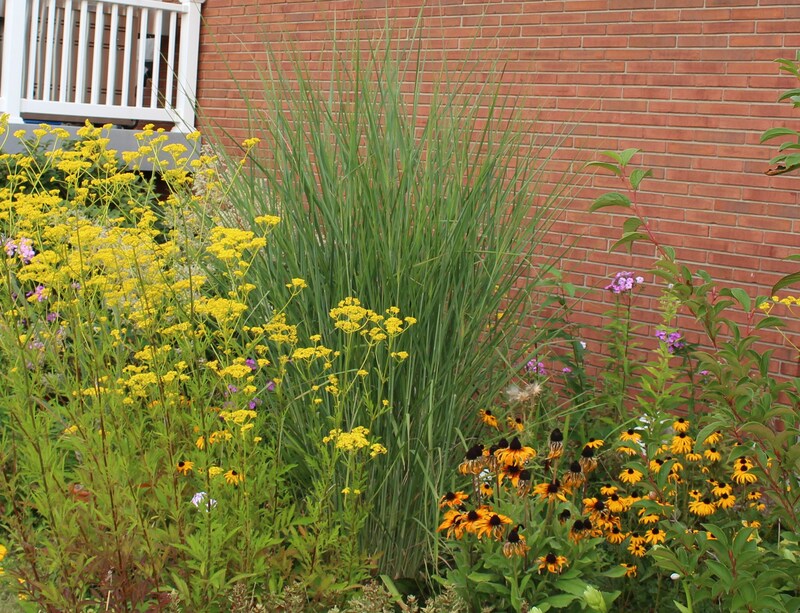 The stepchild bed with Patrina, panicum, rudbeckia, and phlox. So much for anything that even approaches subtlety. 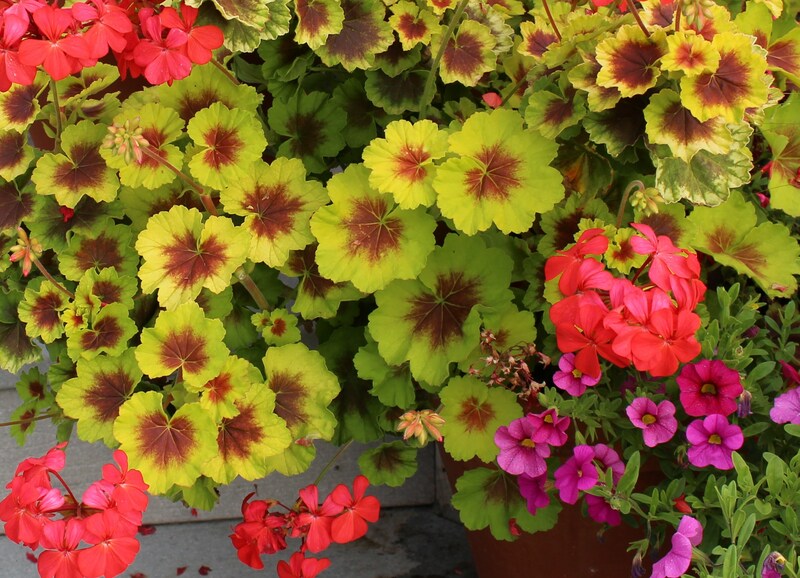 My tropicals come next, and first off are the geraniums (pelargoniums) which in my delusion and denial I have added to the overwinter and collect list. I have to dig up the name for this one, it’s in its second or third year with me and keeps looking better. 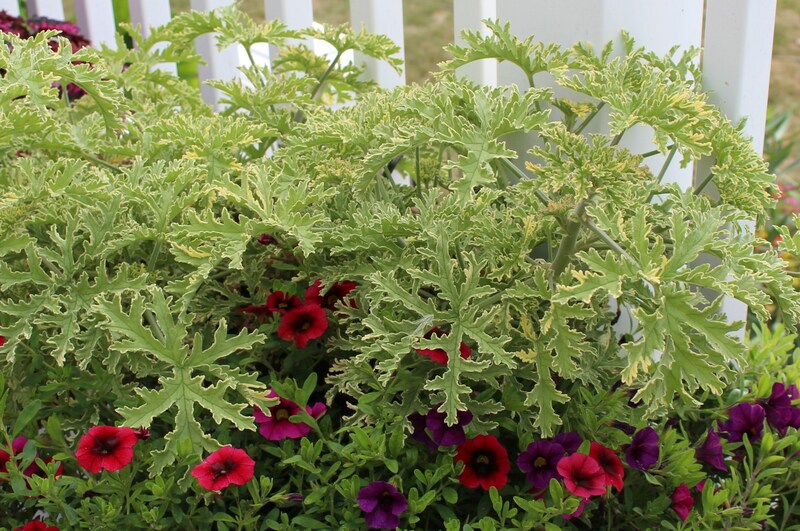 A scented leaved geranium (pelargonium actually) with cut leaves, variegation and scent. Too much or something for everyone? This scented geranium is another plant who’s ID is lost in the pot-full-o-tags database. I should probably work on that. 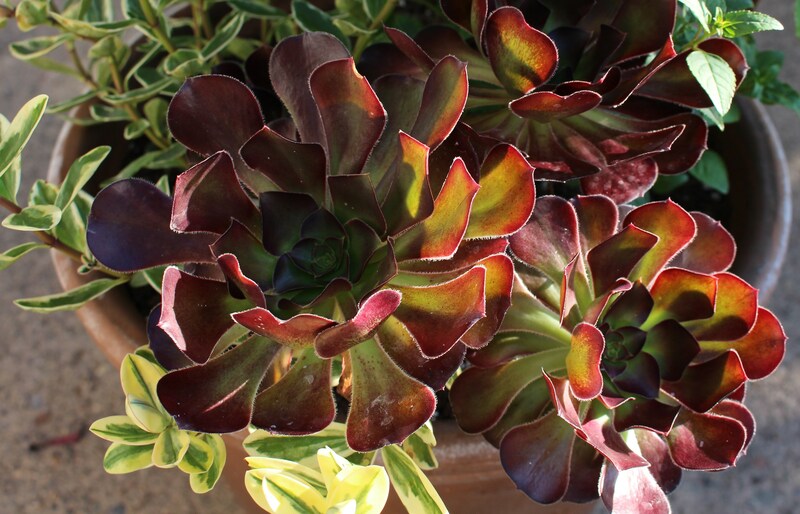 Another one to overwinter in the garage, my first aeonium is looking well. Hopefully it can handle the high-water location I planted it in -a pot with a variegated hebe and cape fuschia (phygelia). This one’s label must still be near the top of the tag bucket since it’s a new purchase. A good gardener would go out there, find it and label it…. but all I’ve got for you is it’s not “Schwarzkopf”. Now to wrap things up (so I can finally get to work on the stupid basement tiling job I started) here are my foliage stars. 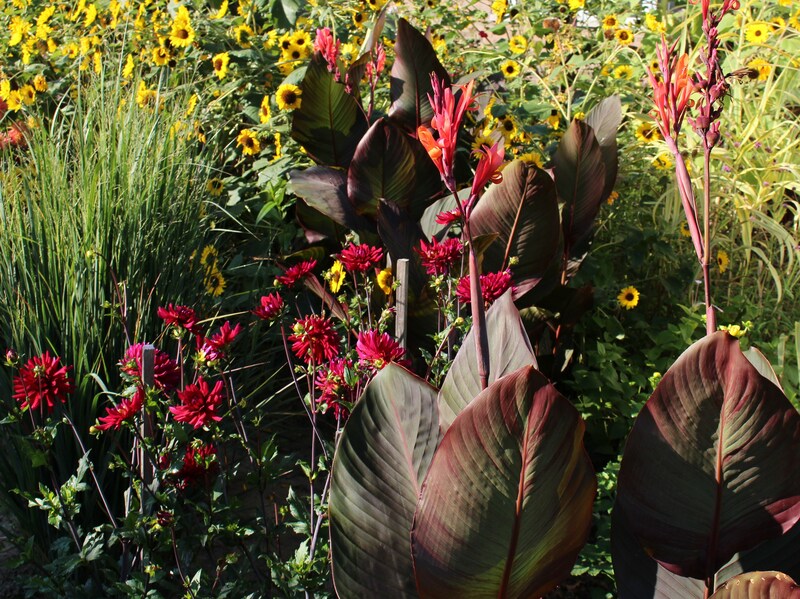 Canna “Tropicana” might be the most obscene show of gaudy color in my garden. I love it with the dahlias and rudbeckia. Good thing there’s some green nearby to calm things down. Morning light on the sunflower patch. My ‘Polish cannas’ were a gift which traces it’s history back to a friend’s old Polish neighbor. 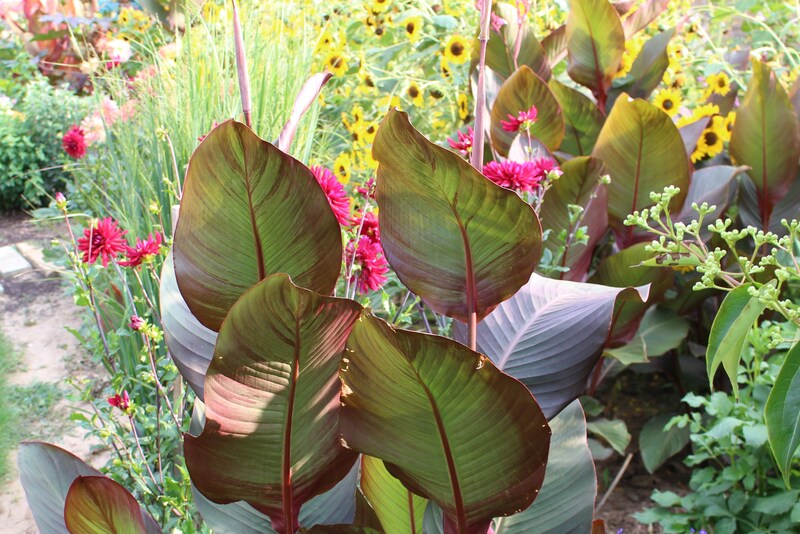 It’s probably really canna indica “purpurea” or “Russian red”. And same cannas at noon. A sculptural plant I think. The small blooms aren’t much for a flower lover, but they have a graceful look and the hummingbirds appreciate them. So that’s my foliage, thanks for sticking it out. I did manage to keep all the coleus out (but of course there’s still all of September for that) and I hope that gave a little relief, but I was really surprised by how much color and interest I get from foliage. Maybe I am growing up and my tastes are maturing…. but I hope not. I like my messes of color too much! Thanks Christina for hosting and thanks for opening my eyes to all that foliage does in the garden. 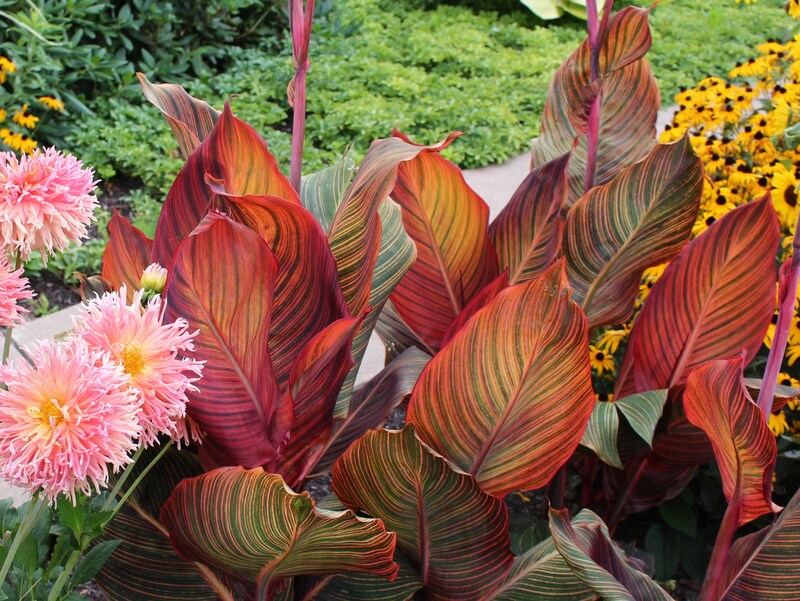 This entry was posted in annuals, garden, garden design, late summer, perennials, shrubs, soil prep/compost and tagged canna tropicanna, colorful foliage, foliage in the garden, garden color, Summer, variegated foliage, yellow leaved plants. I love all your beautiful foliage, there are so many lovely ones. 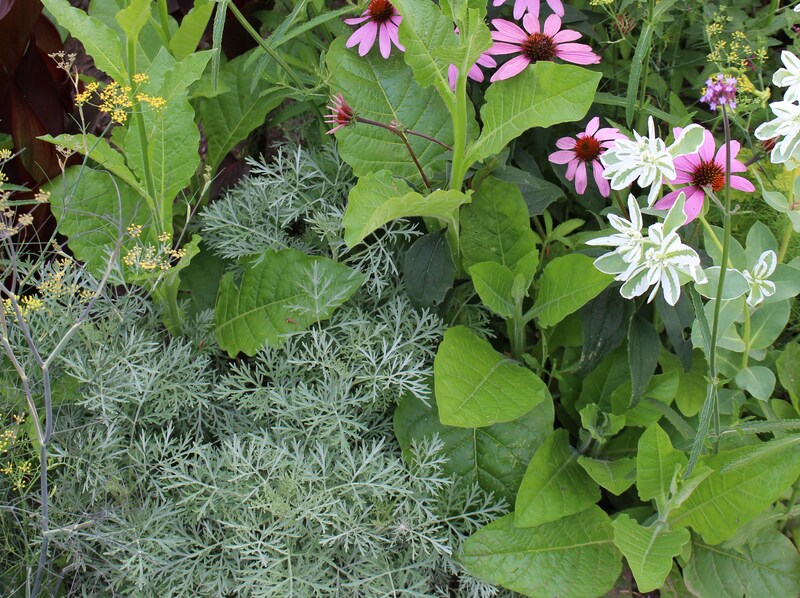 Your Artemisia, Amaranthis, Salix and your red Cabbage are gorgeous, you have so many lovely contrasting groups. I also like the grouping with your blue Cedar and Sumac. Thanks Pauline. I do like contrasts, but sometimes think I have too many and should work on a few harmonies…. but then I get distracted by another boldly colored or intricately cut leaf! You have a lot of nice foliage interest. I like the contrast too of the Red cabbage and fig leaves. Thanks Susie. 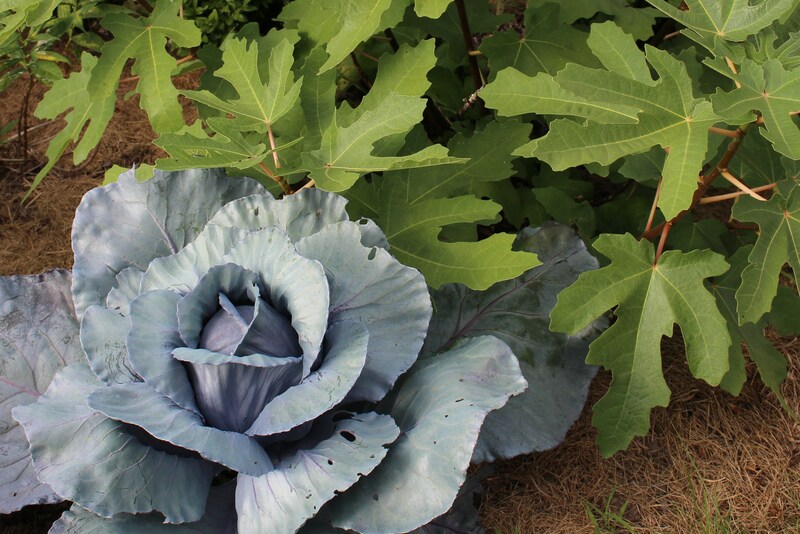 I always think the cabbages have great foliage and this year for some reason the cabbage worms have stayed away. Lots of lovely foliage. I am impressed. I love your yellow Salix, I’ ve never seen that before. Gorgeous Cannas. Thanks Chloris. If you were closer I’d give you a stem. The cannas come and go. I used to have more but lately there have been too many things coming in for the winter. Three tubs of canna roots might be my limit. I think when it starts to get cold here I’m going to have a big mess to deal with. Too many of my purchases have been of the “hmmm I should try and keep this over for next year” variety. I fear the garage doesn’t have THAT much available space! …. and I may have left quite a few cannas and dahlias in the ground last year…. This is a second try at leaving a comment. WordPress said there was a problem! You have a lot of fabulous foliage Frank, and of course you are a serious gardener so why wouldn’t you? I love the Cannas, they need too much water for me to be successful with them but what I envy is the Miscanthus gigantia, I have this too, I planted it about 3 years ago and with the rain this summer (it is always irrigated) it has grown a lot but is still only about 5 feet tall not the 7 or 8 I was hoping for. The little grouping with the Artimesia is charming. I shall keep the miscanthus then! I think I was just a little disappointed in it for drying out the last two years and might also have to consider putting some irrigation on it for better luck. Hmmm. I never considered taking on the label “serious gardener” before, I’ve always thought of it as dabbling. This might be the first time I ever realized it might be more. Funny how you sometimes need to have the most obvious things pointed out! Thanks Annette. I do like my cabbages and kales, and for some reason (outside of woodchuck and deer attacks) the foliage has been nearly untouched this year. I’ve seen cabbage whites but none of their children seem to be making it. I also love the heptacodium, if it can only avoid the loss of branches due to cankers it should develop into a beautiful small tree. My fingers are crossed! I really love that yellowy salix foliage Frank. Very fresh looking. Has the scented geranium ever flowered for you? I was given one this year and it has just got bigger and bigger and i’m not sure what to do with it now! Take cuttings? Cut back to bring indoors in autumn? Look forward to a Heuchera post. And a coleus post too! My geranium shows no signs of blooming. I’ve seen bigger ones put out flowers, but maybe these are still too small? I think I’ll just throw the whole thing as is into the garage, keep it dry and close to death and hope for the best. I overwater cuttings of these and they always rot before rooting, so I haven’t solved that problem yet either, but if I could root some that would probably be the best way to go. I think I’ll try cuttings as I tend to forget to check on anything that isn’t on a windowsill over winter! I like the cannas for the exotic feel they give a garden. This is the first year I have tried Cannas myself–I have a couple growing in pots. I started them very late and the Japanese beetles found them, so it’s not an impressive show here yet. : ( I need to do some research to find out whether it would be safe to put them in the ground here in deer and woodchuck land. I also like the Circus Clown heuchera. Hadn’t seen that one before–there are so many varieties! No idea on the deer-woodchuck-combo, beetles do bother mine, but usually not much else does….. but deer? They might sample them out of spite! Let me know if you want a couple extras to experiment with. 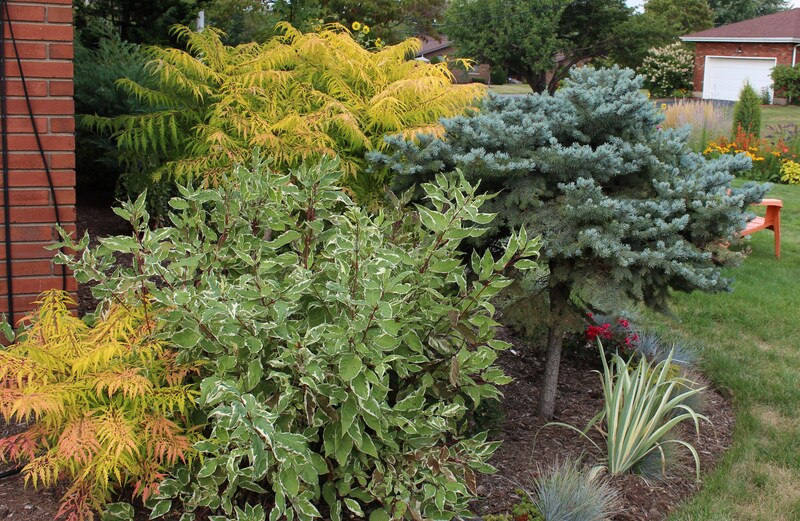 Many good foliage plants, looks like you actually planned to make sure you would have interesting leaf color and shape. I like the Amaranthus especially. Who knows if it was planned, maybe my subconscious has been working hard all along while the rest of my brain has been slacking. The amaranthus is a great easy come, easy go, plant. I have no regrets pulling out bucketfuls yet am always happy to leave a few.